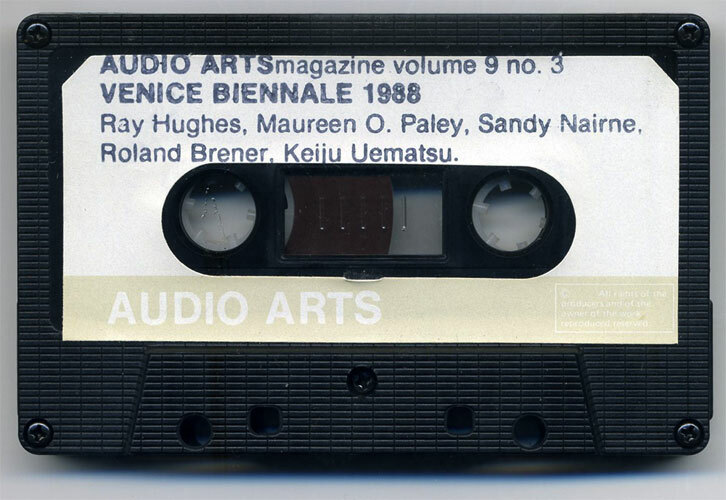 This issue of Audio Arts cassette magazine features a variety of interviews with curators, art dealers or artists recorded in Venice during the 1988 Biennale. While the cassette exclusively collects interviews and conversations – there’s a nuance: compare #2 and #15, for instance–, it clearly shows William Furlong‘s approach to sound and mise-en-scène of speech. Each interview has its specific sound environment, and background noises are purposefully included to complete the picture. 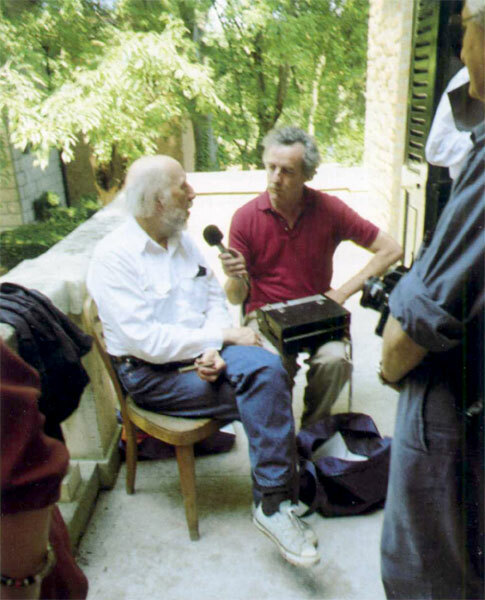 Furlong’s habit was to record his interviews outdoor or amid the visitors of an exhibition, and such is the case here (pictured right: WF interviewing Richard Hamilton, Venice Biennale, 1993). Each track also includes various ambience noises like PA announcement, art crowd chatting, sound installations, etc. For Furlong, this strategy allowed him to “gain access to spontaneous opinion, analysis and commentary”, to the extent where “the discussion becomes part of the event.” (from Audio Arts: Discourse and Practice in Contemporary Art, p.80, Academy Editions, UK, 1994). 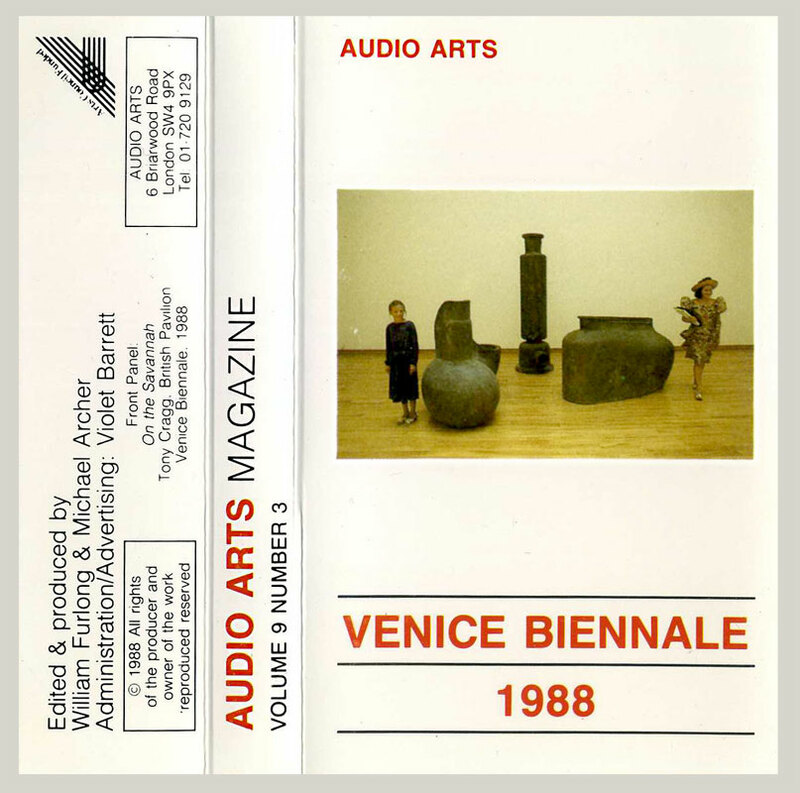 The Venice Biennale 1988 edition was the 43rd Art Exhibition of its kind. It was subtitled Il Luogo Degli Artisti (or The place of artists), and directed by Neapolitan art critic Giovanni Carandente. 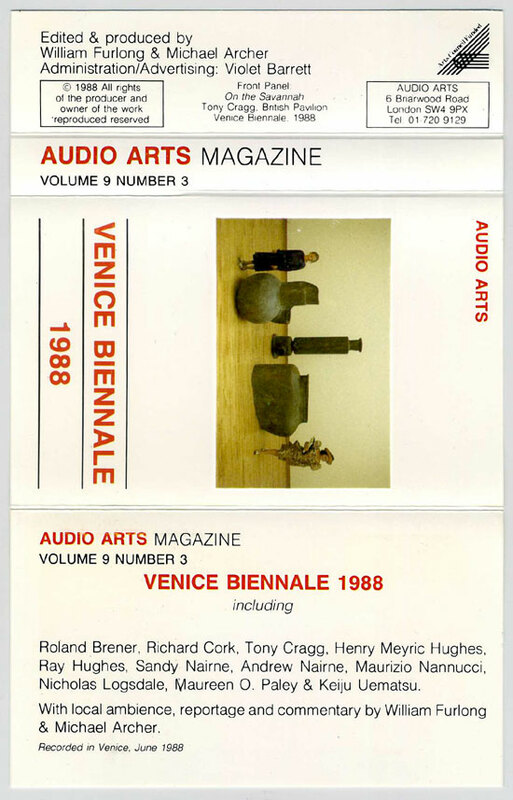 At the time, around 30 countries had their own building, or pavilion, inside the Giardini gardens, and 1988 saw the launch of Australia’s pavilion. Less fortunate countries still had access to the themed, group exhibition curated by the Biennale’s director. The awards went to Jasper Johns, Barbara Bloom, Tony Cragg and Enzo Cucchi, as well as the best pavilion prize to Italia. thanks for the previous AA issue. as a Hugh Davies fan it was great to hear the duet with Toop. I’m wondering if you would consider upping the Frank Garvey lps. tbe Sanity Muffins blog seems to not be active anymore as are the links and I saw your comment there. Hi, Andy. I only got Garvey’s Labyrinth LP from Sanity Muffins. Thanks! Pity, the description of Omnicircus sounds very interesting. Frank Garvey’s Omnicircus website lists several CDs and DVDs.